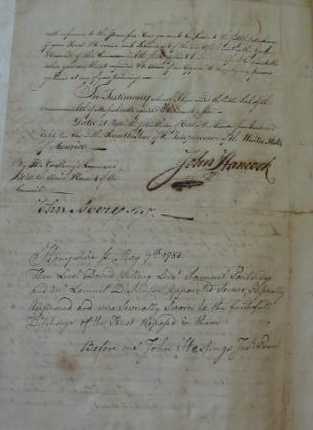 This document signed by John Hancock & notarized by Hon. John Hastings (1738-1811) was photographed in Hatfield, MA by John Hastings' descendants Julie Hastings-Barnes & Ann Guenther. 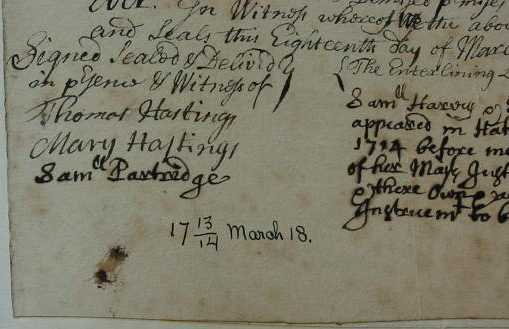 This document signed by Dr. Thomas Hastings (1679-1728) & his wife Mary Field Hastings was photographed at Hatfield, MA by their descendants Julie Hastings-Barnes & Ann Guenther. Note the date showing old style (March 18, 1713) and new style (March 18, 1714). This document written & signed by Ephraim Hastings in 1847 was photographed at the Groton Township, Erie County, Ohio office by his descendants Julie Hastings-Barnes & Ann Guenther. This marriage registry showing the marriage of Ephraim Hastings and Sarah Parker in 1825 photographed at the Huron County Courthouse in Norwalk, OH by their descendants Julie Hastings-Barnes & Ann Guenther. This photograph taken approximately 1870 is of the cabin owned by James Hannum Hastings in Parkertown, OH. A local historian has dated the cabin style to 1820-1830, which means it may have been built and occupied by Dr. Waitstill Hastings, James' grandfather, or by Ephraim Hastings, James' father. The photograph was given by James Hannum Hastings' descendant, Patt Scott, to Julie Hastings-Barnes & Ann Guenther.